Frederick Engraving offers dozens of Christmas ornaments personalized to celebrate and commemorate your holiday season in style. Whether you are a proud first time grandparent or your first holiday season together as a couple, we have the perfect personalized family ornament to help you make memories. Our customized ornament are available in a number of different shapes, and can been crafted from engraved wood or lucite. We also laser cut lucite and wood to create simple yet distinctive monogram and name ornaments. 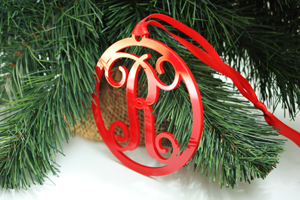 Order a custom ornament with a first name, family name, or monogram style initials. Our Christmas ornaments can be personalized with names, dates (birthdates or just the year), and different motifs. These include angels, snowflakes, holly, baby footprints, and dynamic stick figures to represent members of your family. Whatever the occasion, Frederick Engraving has Christmas ornaments that can be personalized to perfectly commemorate it. All ornaments are made to order and priced affordably, at under twenty dollars. Distinctive ornament shapes available include Christmas stocking, Christmas trees, snowmen, hearts, and crosses. Our most simple ornament, but one of our most striking, is a laser cut monogram available in a choice of over fifty colors. To order, simply choose a color from our color chart and enter the initials desired. We will craft the ornament to order in our workshop. One of the more popular items in our personalized family ornament line allows your child to give his or her Christmas list to be engraved, along with the year. This really allows you to preserve priceless memories for the years to come. See how your children grow and change over the years, in their own words.